Ever wonder if all this talk about integration between marketing technologies and CRM actually holds water? You probably have a marketing and sales process that is working today. It may or may not involve integration between marketing and CRM. But no matter what your situation is, everyone can benefit from the best practices that are most frequently adopted among organizations that achieve superior performance in revenue growth, response rates, and lead-to-sales conversion – we call them Top Performers. 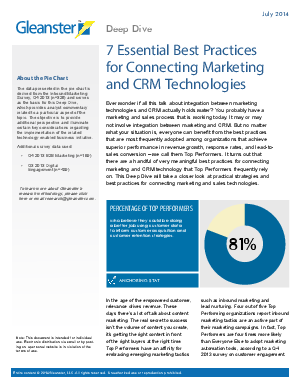 It turns out that there are a handful of very meaningful best practices for connecting marketing and CRM technology that Top Performers frequently rely on.